Southern defenders Coltin Parker (22) and Austin Baker (20) apply pressure to Trimble’s Brayden Weber during the second half of Friday night’s boys basketball contest in Racine, Ohio. RACINE, Ohio — The opportunities were there. The desired results, however, were not. 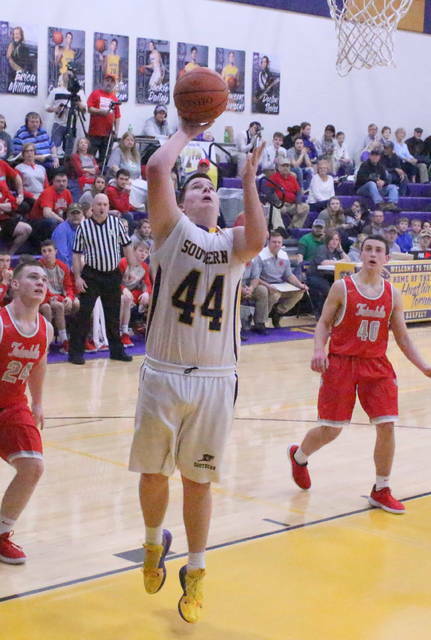 The Southern boys basketball team struggled to finish off open looks around the basket, while visiting Trimble did just enough to stay on top of the league standings Friday night following a 59-55 decision in a Tri-Valley Conference Hocking Division matchup in Meigs County. The host Tornadoes (10-9, 8-6 TVC Hocking) led only 19 seconds of the 32-minute affair as the Tomcats (14-3, 12-2) stormed out to a quick 11-point cushion before securing a 16-7 edge after one quarter of play. The Purple and Gold hit six of their first eight shot attempts in the second canto as part of a 14-4 charge that resulted in their only lead of the night at 21-20 at the 3:58 mark, but THS countered with a 7-2 run over the final 3:39 to take a 27-23 lead into the break. Southern mustered a 5-1 run at the start of the third quarter to knot things up at 28-all, but Blake Guffey gave the Tomcats a permanent lead at 30-28 with a field goal at the 5:51 mark. The Red and Gray — who hit 8-of-14 shot attempts to start the second half — followed with a 16-10 run over the final 5:20 that doubled their halftime lead from four points to 46-38 headed into the finale. The Tornadoes closed to within a single point (56-55) following a Weston Thorla basket with 45 seconds left in regulation, but the hosts ultimately came no closer as Trimble netted 3-of-6 charity tosses the rest of the way to wrap up the four-point outcome. Southern missed at least two layup-like shot attempts in each of the four quarters of play, and the Tomcats used some timely offensive rebounding to extend possessions that resulted in some second-chance points. And, at the end of the night, those two factors ultimately proved to be real difference-makers in the final outcome. Afterwards, SHS coach Jeff Caldwell spoke about the heart that his troops showed after falling behind by 11 points roughly six minutes into regulation, but also pointed out some things along the way that just ended up being too much to overcome. “We just didn’t take advantage of the opportunities that were there. We battled back from such a poor start to the game, but you cannot afford to start slow against a quality team like Trimble,” Caldwell said. “We gave up too many offensive rebounds in the first half and we didn’t do a good job of finishing, and somehow we still had a chance to win there at the end. The Tomcats showed their prowess on the board early and often after recording seven of their dozen offensive rebounds in the first quarter alone. Cameron Kittle gave THS its largest lead of the night at 16-5 with a putback basket at the 1:43 mark of the first period. After trimming the deficit down to nine points at the end of eight minutes, the Tornadoes capped a 16-4 run with a Cole Steele trifecta that led to the hosts only cushion of the game at 21-20. Trimble countered with a Jeremiah Brown trifecta before Thorla answered with a basket that knotted things at 23-all with 3:07 left until halftime. Brayden Weber followed with consecutive baskets over the final 2:56 of the half that gave THS a slim 27-23 edge at the intermission. Trimble owned a 20-16 edge in rebounds at the break, which included a 12-7 advantage on the offensive glass. The Tomcats had only three of the 11 turnovers in the first half and also produced 10 extra field goal attempts. Austin Baker produced five straight points during a 5-1 run at the start of the third, which tied the game up at 28-all at the 6:26 mark. The guests, however, hit seven of their next 11 floor attempts during an 18-8 surge that extended the THS lead back out to double digits at 46-36 with 48 seconds left. Trey McNickle hit two free throws just before the quarter ended — cutting the deficit down to eight points entering the finale. Up by a point in the final minute, Guffey netted the first of two free throws to extend the lead out to 57-55 with 38 seconds left. Jensen Anderson missed a would-be game-tying shot on Southern’s ensuing possession, and Weber made 1-of-2 free throws following a rebound with 20.2 seconds left. Thorla came up empty on a pair of shot attempts on the Tornadoes next possession, and Sawyer Koons hauled in the rebound before being fouled. Koons netted the second of two tries with 5.8 seconds left for a four-point edge, and Southern ultimately came up empty again on its final possession as the horn sounded. Trimble outrebounded the hosts by a 35-30 overall margin, including a 15-9 edge on the offensive glass. Southern also committed 14 of the 24 total turnovers in the contest. The Tornadoes connected on 22-of-56 field goal attempts for 39 percent, including a 6-of-22 effort from behind the arc for 27 percent. The Purple and Gold were also a perfect 5-of-5 at the free throw line. Anderson paced the hosts with 13 points, followed by Thorla with 12 points and Arrow Drummer with 10 markers. Baker was next with nine points, while Steele and McNickle respectively added five and four markers. Brayden Cunningham completed the SHS tally with two points. McNickle hauled in a team-best nine rebounds, while Baker and Thorla respectively grabbed eight and four caroms in the setback. Trimble netted 24-of-61 shot attempts for 39 percent, including a 4-of-14 performance from 3-point territory for 29 percent. The guests were also 7-of-16 at the charity stripe for 44 percent. Guffey led the Tomcats with a game-high 18 points, followed by Weber with 15 points and Brown with 14 markers. Kittle was next with seven points, while Koons completed the winning tally with five points. Weber also finished with a double-double after bringing down a game-high 13 rebounds. Kittle and Guffey also grabbed eight and six caroms, respectively. 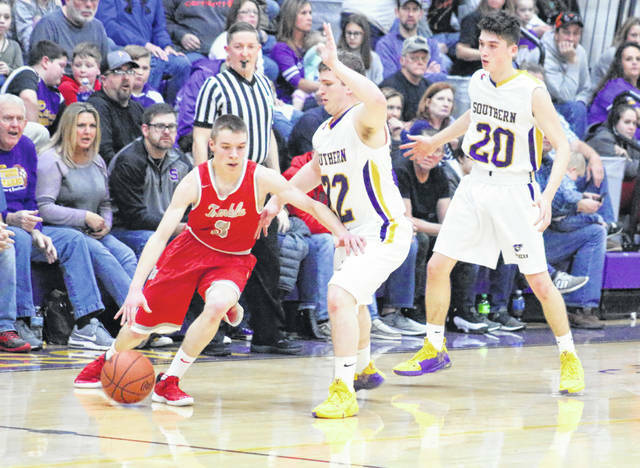 Trimble — which is still one game ahead of Waterford in the league standings — claimed a season sweep of the Tornadoes after posting a 59-45 decision in Glouster back on Dec. 18, 2018. The Tomcats are now 8-1 on the road and have won 7-of-8 overall, including three straight. SHS, conversely, is now 6-5 at home and has dropped 2-of-3 after winning three straight. Southern returns to action Tuesday when it hosts Miller in a TVC Hocking contest at 6 p.m.